Are you ready for some Tap Ball!? Tap Ball is the newest sensation sweeping the streets of Springfield. A game invented by our very own Homer J Simpson! In the Second “Act” of the Tap Ball Event (funny they’re called Acts, really they should be called Periods like Hockey. Oh EA, I thought you knew sports 😉 ) you’ll unlock Tennis Marge, FIT Milhouse, unlock Community Challenges and continue to challenge your friends and neighbors to some friendly Tap Ball competitions! This Event is broken up into 3 Acts (again, should be called Periods EA…), with each Act containing part of the story. To help you move along with the event you’ll get several prizes per Act. Each prize will either be something fun for Springfield or something to help you move along in the event. For the Second Act you’re tasked with collecting Hats ( ) to unlock each prize! The third Act 2 prize awarded at 17,800 is Springy, a new NPC (non-playable character) for your Springfield! So let’s take a closer look at this life-like spring and find out just what happens when you unlock it in your Springfield. 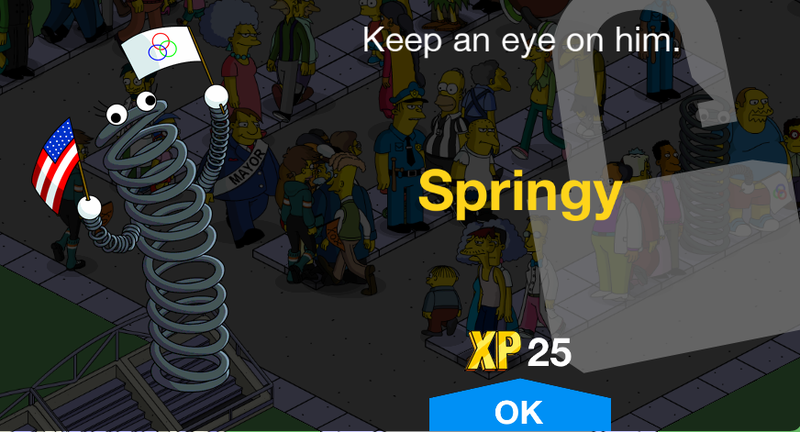 You can choose to store Springy in your inventory or place it in your Springfield now. Remember if you place it in your inventory you’ll have to go into your inventory to retrieve it later. 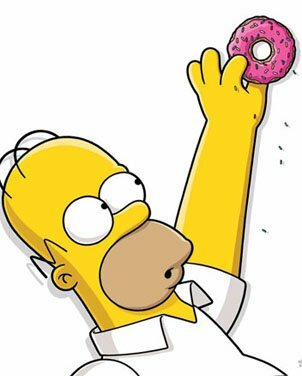 Homer: *singing* IT’S SPRINGY THE SPRINGFIELD SPRING! *singing* IF SPRINGY SPRINGS ARE YOUR THING *singing* YOU’LL SPRING AT THE CHANCE TO SING *singing* OF SPRINGY THE KING OF SPRINGS! *singing* WHEN SPRINGTIME IS IN FULL SWING *singing* HE COMES HERE FROM OLD BEIJING! *singing* TO BATHE IN SPRINGFIELD HOT SPRINGS *singing* AND DO LOTS OF TERRIBLE THINGS! *singing* HIS INSULTS CAN REALLY STING! *singing* HIS POLITICS ARE FAR RIGHT WING! *singing* HE LIKES TO STEAL WEDDING RINGS! *singing* HE ALSO SETS FIRE TO THINGS! *singing* SPRINGY THE SPRINGFIELD SPRING! 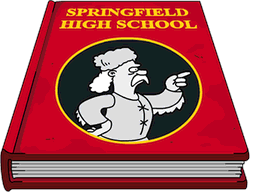 *singing* IT’S A REALLY UNFORTUNATE THING *singing* THAT SPRINGFIELD MUST HOST THIS SPRING! *singing* THIS ANIMATE, EVIL SPRING! Springy is a NPC (non-playable Character), so he won’t have any tasks. He’ll just hop around your Springfield like other NPCs do. And that’s it to Springy the Springfield Spring! What do you think about Springy? Have you unlocked it yet? Thoughts about the event overall? 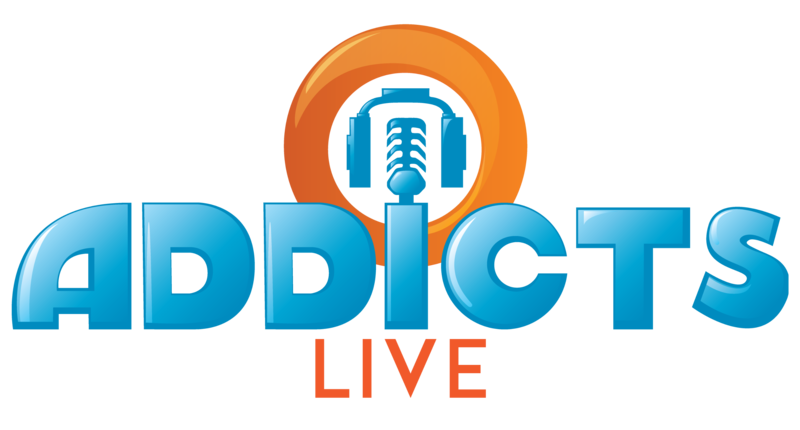 Any prizes you’re most looking forward to? Sound off in the comments below, you know we love hearing from you! 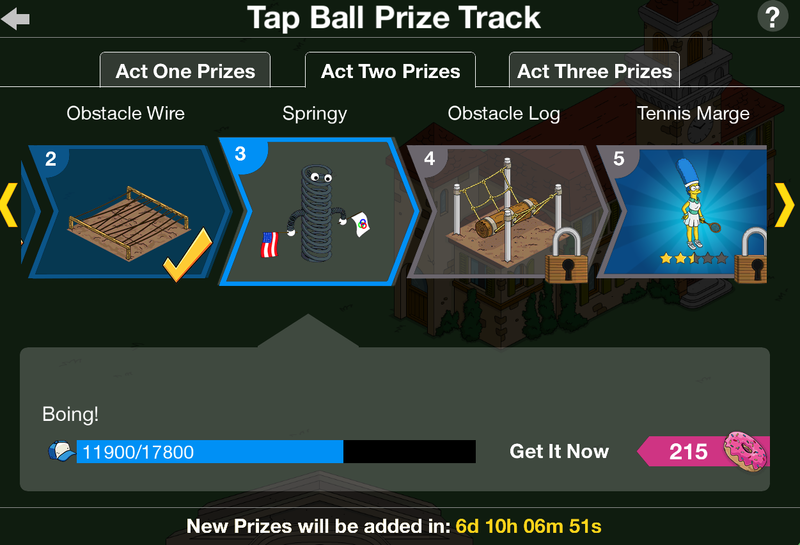 This entry was posted in Characters, Tapped Out, Tips and Tricks, Updates and tagged Act 2 Prizes, Does Springy have any tasks?, Hat Prizes, Springfield Spring, Springy, Tap Ball Event, Tapped Out Tips and Tricks, The Simpsons Tapped Out, TSTO Addicts, TSTO June 2015 Event, TSTO Soccer Event, TSTO Tap Ball 2015, TSTO Tips and Tricks, What can Springy do?. Bookmark the permalink. Interesting, I received a notice that my Tap Ball Payers had played 30 games today, were exhausted and could play no more for today. But then I sent them out myself. Wow! My friends really like playing me! I’d be curious to know how many stars your team is rated…what rating is the most popular with other folks when they choose someone to play against.